Because the workshop series is intended as a recruiting tool, I wanted our promotions (including some paid Facebook ads) to direct visitors to a page with a clear call to action — RSVP Now! — with no distractions that might tempt them to click away to another page or blog post. That meant the regular page sidebar and the menu at the top of the page had to go. The landing page would also trim away information about the event aimed at club members, such as signup for specific meeting roles. For my featured event, I would present just concise promotional copy, an image, and the signup form. For two other, “You might also be interested in” events, only the RSVP Now! button would be displayed. 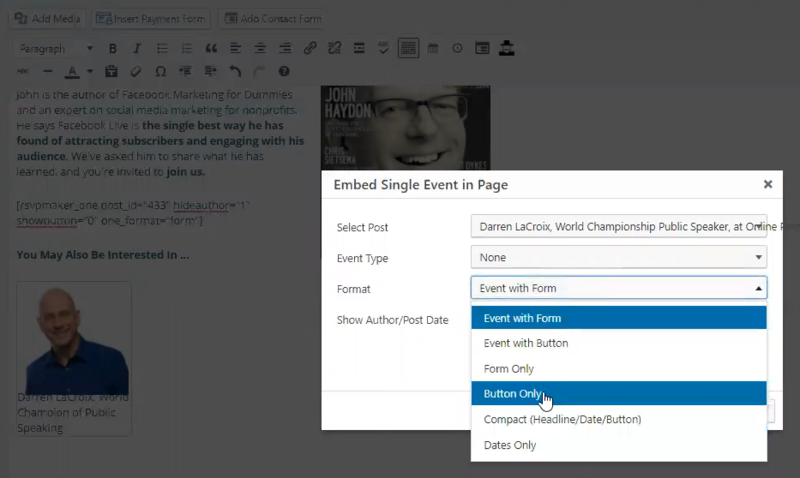 I took advantage of the shortcodes for displaying a single event introduced in December but decided to add an editor button to make them easier to set up. Another context in which you might use this would be embedding an event in a blog post, along with some introductory copy. This brings up a dialog that allows you to select a single upcoming event. Alternatively, you can set it to Next in which case your page will display whatever the next published event on the calendar is. 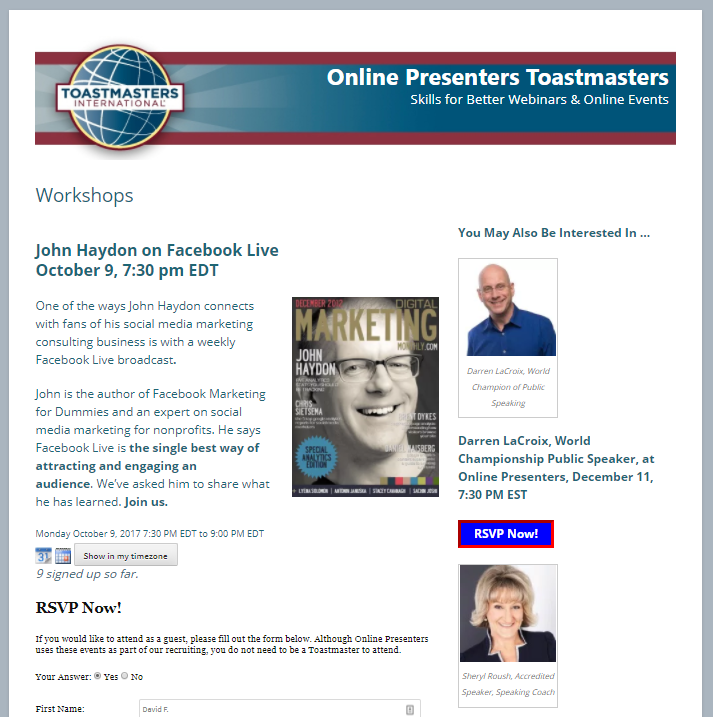 If you choose Next, you can also select an event type — for example, I have a page on this site that lists my next scheduled RSVPMaker webinar. You can then choose whether the whole event should be listed, with either the RSVP Now! button or the registration form displayed. Or you can choose to display only the form, or only the button. In addition, there is a compact display with just the headline, date, and button. Here is the demo I shared at Online Presenters this week. This demo took advantage of the Landing Page template included with my Lectern theme. That template has no sidebar, no menu up top, and a stylesheet with larger fonts for body copy. There are many other themes and plugins aimed at creating the perfect landing page. Many themes include a full-width page template that eliminates the sidebar. For a basic landing page, you could choose a full-width template and, if appropriate, check the “Hide menu” checkbox RSVPMaker adds at the bottom of the page editor. This should work with most themes to surpress the output of the standard menu on that one page. You could also use a page builder utility to design a multi-column page, rather than inserting custom HTML as shown here. I tested the shortcodes with Beaver Builder, although I haven’t been able to get the insert calendar/insert event buttons to show up properly within their specialized editor.